Jacob Thorssell won't be coming to Panthers after all. Peterborough Panthers have seen their swoop for Swedish racer Jacob Thorssell blocked by the authorities. The city team unveiled their new recruit yesterday (June 30), but the move was later thrown out by the British Speedway Promoters’ Association (BSPA) who have deemed him ineligible to race at Premier League level. Their ruling is due to the former World Under 21 finalist boasting an Elite League average in excess of six points at the start of the 2015 season. His mark had dropped to 4.91 when a deal was struck with Panthers earlier this week and is currently 5.30 for July, but the signing has still been turned down. That is despite Thorssell, who races for Wolverhampton at the top level, being recommended to the club by a member of the BSPA management committee, according to angry promoter Ged Rathbone. Rathbone blasted: “The club and Jacob are devastated the move has been blocked as we were led to believe he would be eligible to ride in the Premier League. “I must stress there is no wrongdoing on the part of the Peterborough management here. “A member of the BSPA management committee, who I won’t name, suggested we tried to sign Jacob after we had initially enquired about the availability of another rider. “We proceeded to complete a deal with Jacob only for the BSPA management committee to then block it. “It was obviously an oversight on that individual’s part, but it is one which is extremely disappointing to say the least. “We believe Jacob would have points on the board and bums on seats which is what Peterborough Speedway and the sport as a whole needs. “But what this decision also means is we are unable build a team to the points limit. We cannot go for any rider who has possessed a six-point average in the Elite League this season. “In a nutshell we find ourselves in a position where the rules dictate that we cannot sign a rider of number one calibre and that is a huge bone of contention. “We appreciate the supporters will be disappointed at this development, but I can assure them that no-one is more disappointed than me. Panthers had drafted in Thorssell as a replacement for Olly Allen whose season was ended by ankle injuries suffered in a crash back in March. The club have used guests to deputise for Allen until now, but that option is no longer available as he has dropped to second in their averages. Captain Ulrich Ostergaard takes over as number one in July with rider replacement now the only facility available to cover Allen’s absence. 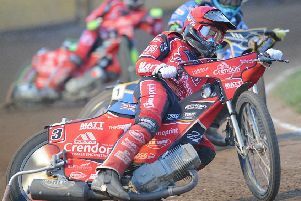 Club bosses are understood to be keen to sign a new rider as soon as possible – ideally ahead of their Sunday clash against bottom side Redcar at the Showground (4pm).